Daniel Schroll, 94 of LaRue, died peacefully Wednesday, March 27, 2019 at his home. 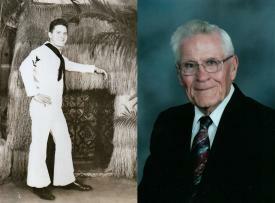 Dan was veteran of the Navy, serving on the USS North Carolina during WWII. He worked over 40 years at Quaker Oats in Marion, retiring in 1986. He attended the Marion First Church of The Nazarene for over 30 years. When he was able, he enjoyed deer hunting, attending the reunions in Wilmington, N.C. for the USS North Carolina Assn. He also enjoyed going to the Quaker Oats retirees get togethers. Dan always took pride in taking care of his property and was known to make a very good spaghetti. He also loved spending time with his grandkids. On July 25, 1970 he married Shirley (Burbaugh) and she survives, also surviving are his children: Jay (Sandy) Bowles of Lewistown, Scott (Brenda) Bowles of Corpus Christi, Texas, Teri (Steve) Duprey of Prospect, Joy Preston of LaRue and Julie Bowles of Toledo. Funeral services will be held Monday April 1, 2019 at 11:00 am at the Stofcheck-Ballinger Funeral Home in LaRue, Dr. David Wilson will officiate, burial will follow in the LaRue Cemetery, there will be Military Honors conducted by the Richwood Area Veterans. Friends may call Sunday from 2-4 pm at the funeral home in LaRue. We are sorry to hear about your Dad. We thank him for his military service. Our prayers are with all the families at this time. Dan was a good stepfather and great example of a man to look up to. Thank you for everything you did for us and being a great American. You served your family and country and it was a honor to know you. Rest In Peace! Our sincere condolences for your loss. He was an important part of the Battleship NORTH CAROLINA for so many decades. He will be truly missed. The Schrolls have been part of the Battleship NC family for many years. Their ready smiles were always a welcome sight. We salute Dan for his service to our country during WWII. He will be missed. Robert and I send our sympathy. Dan will always be remembered for his kind ways and easy smile. The beautiful wood cross you gave us for our wedding still has pride of place in our home, a reminder of the love of Christ, the love that Welcomed Dan to heaven, the love that is with you in your time of loss. Our family has been blest to share friendship, love,as well as much joy & laughter with Dan .Our families traveled together shared meals together played board games together & we loved hearing Dan’s stories & jokes! His stories of growing up with 17 siblings and serving iin The Navy during WWII were the best! We loved Dan & are honored to have walked a portion of life’s journey with him as a trusted friend! Dan will be sadly missed! So sorry to hear of Dan’s passing. Prayer of comfort for you all. Prayers for strength in the days ahead and to find comfort in your wonderful memories. So sorry for your lose. Praying for all your family as you face the days ahead. Shirley, my heart is breaking for you and your family. Dan was such a special person and will be remembered for his friendly smile and his wonderful stories. You both enriched our time spent at the Battleship reunions, it was a blessing when we met you there in the break room, sharing a table with you and forming a long lasting friendship. Those wonderful days will always be remembered. May God be with you during this difficult time. Our love to you and your family.